MM's Kitchen Bites: Asparagus Soup...never ending season!! 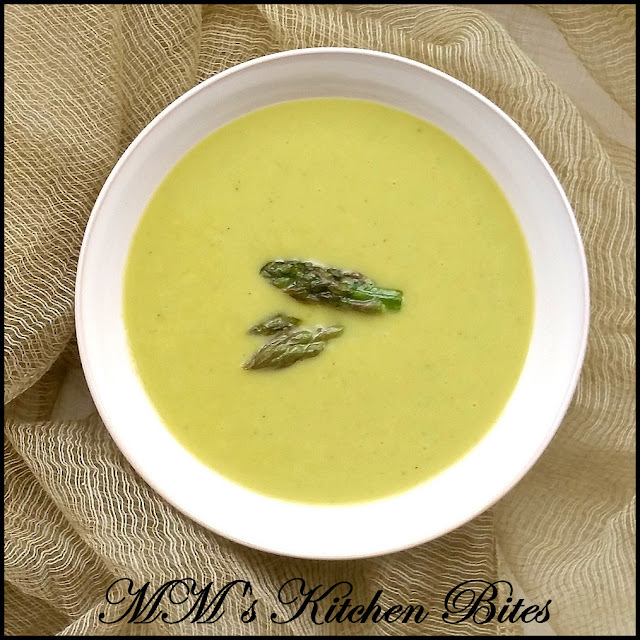 Asparagus Soup…because the soup season is a never ending one here J and because they tell me that this is the best time to have British Asparagus…after our fill of grilled, steamed, roasted all of May we have now shifted to soup…tastes great whether served hot or cold. Prepare the asparagus: reserve the tips, discard the woody tough fibrous ends and roughly chop the stalks. Heat the butter and oil until foaming in a large saucepan or Dutch oven. Fry the asparagus tips for a couple of minutes to soften. Remove and keep aside. Add the onions and garlic to the same pot and fry for 2-3 minutes till they just begin to soften without changing color. Reduce the heat to low, sprinkle the flour over the onions and stir for a couple of minutes ensuring that the flour doesn’t stick to the bottom of the pan. Whisk in the milk slowly. Add in the chopped asparagus, stock, salt and pepper. Leave to simmer for about 15 minutes or so, stirring occasionally until the asparagus is very tender and cooked through. Cool slightly and then blend the soup either using an immersion blender or a food processor till smooth. Taste and adjust for seasoning. If the soup is too thick, add a little hot water to loosen it up. If you have used milk, don’t let the soup come to a boil while reheating. Garnish with asparagus tips and serve hot or cold.